What is the difference between private car and car-sharing? Private hire vehicle is an usual car- booking way. Car- sharing is the way you book and use car with other people to save money. When you choose car- sharing service, DichungTaxi will match up you with other passengers in the same direction. The price of car- sharing is lower than that of private car by 40%. When should I choose carpooling service ? If you travel alone or with another person to the same destination, you should use car- sharing service. This helps you save up to -40% and enjoy a greener and convenient trip. If I travel with a friend will the price be higher? If you travel with a friend from the same place to the same destination, the price for 2 people will remain the same as one for 1 person or increase by 20,000 VND. Do the drivers of car sharing service pick-up on time? According to DichungTaxi’s transportation policy, with car- sharing service, drivers will pick you up around the request time +/ - 15 minutes This means you may get in a car around 15 minutes earlier or later than your request- time. In this situation, DichungTaxi will contact with you to tell you the correct time when drivers come before 60 minutes. Please read the detailed steps here. 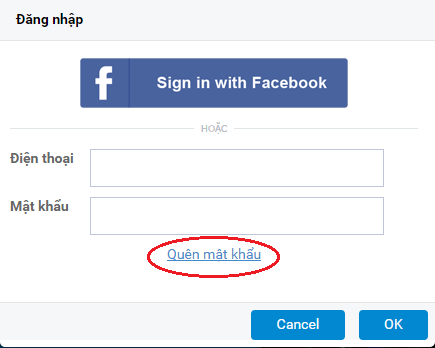 How to Login in the account ? Why does the system say that "already have an account," but I have not created any? When booking a car at step « Enter your information », you possibly choose the option : create an account with your phone number. In this case, the system will automatically create an account for you. Therefore, you can retrieve your password and use your phone number to log in. If I forgot my password, how to get a new one? Step 1: At home page www.dichungtaxi.com, on menu bar, you choose « Account » and click « login ». Step 2: A notification appears (image below). Click « Forgot password ». The system will send new password to your phone. You can you this to log in. How to book online with www.dichungtaxi.com ? Please read the detailed instruction here. What is the difference between booking on the website and booking directly the operator ? - Enjoy a new and convenient booking service. - Compare the price of different types of cars and make choice. What are the instructions when using car-sharing service ? - The drivers will pick you at your request place. - Departure time: 2 hours 30 minutes before flight. - Booking time :1 hour 30 minutes before departure time, 4 hours before flight. - Pickup time: around your request time +/- 15 minutes. - The number of passengers choice: the number of passengers is equal to the number of seats that you use. For example, if you travel alone, you choose the option : 1 passenger, if you travel with a friend, you choose the option : 2 passengers. DichungTaxi will match you ( or your group) up to other passengers. - Luggage: 1 medium suitcase + 1 bag/ person ( hand luggage when travelling by plane). Can I book a car for another person? You can book for another person. Option 1: Book with your information. We will contact with you as a passenger. Option 2: Booking with passenger’s information. In this situation, we will contact directly with him/her. Do Dichungtaxi drivers can pick-up on early morning or late night ? DichungTaxi provide 24/7 service at over 20 airports in Vietnam. However, with the trip at late night or in early morning (from 9 p.m to 8 a.m), please book before 9 p.m.
How long before departure should I select the time for an airport transfer ? - Booking car- sharing : Choose pickup time 2 hours 15 minutes before flight. - Booking private car: Choose pickup time 2 hours before flight. - Booking car- sharing: Choose pickup time 3 hours 15 minutes before flight. - Booking private car: Choose pickup time 3 hours before flight. How do I know if the booking was successful ? When you receive CAR RESERVATION CODE from DichungTaxi, this means you book successfully. Besides this, we will confirm via SMS, telephone or email. After receiving the booking confirmation , what do I do? When you have car reservation code, DichungTaxi will send you a confirmation via SMS or email. Before the trip, we will send you your driver’s phone number..
Are there penalty charges when cancelling a booking ? How to cancel a booking? Please remember to cancel your booking or change the information 24 hours before departure time. To know how to cancel a booking, please follow the instruction here. Can I get a refund when I cancel my booking ? - With the usual trips, DichungTaxi will refund your payment within a working day since we recieve the information about your cancellation. - With the trip in special occations, DichungTaxi have some specific regulations about the cancellation time. If you break the regulations, Dichungtaxi will collect additional fees from your deposit or payment. Is there any penalty when I change the schedule ? How to change the schedule? DichungTaxi don’t have penalty charges when you change the schedules. ( 1) Cancel wrong ticket and book a new one. For more information, click cancelling booking instruction, booking instruction. + Subject: Change the schedules of my trip. + Content: Ticket code, the information that you want to change. If I cannot find the driver, what should I do? If you can not contact with driver, please call this phone number (+84) 936 070 416, send us an email to ibook@dichung.vn or find dichungtaxi on Facebook messenger. If you travel at late night or in early morning (from 9 p.m to 8 a.m), driver will contact with you at around 9 p.m. In this time, you also receive the driver’s phone number to contact directly with him. When Dichung says a car-sharing trip is 110.000dong for example, what does it mean? With car- sharing service, the price in our webiste is the price that you have to pay for the number of passengers you choose. For example, if you choose the option : 1 passenger, the price 110,000 VND is package rate for 1 person. If you travel with a friend and want to book car- sharing, please read the detailed instruction here. When the price is 180,000d for a maximum of 30 Km, and each additional km is 9,000d what does it mean? This means if the distance is around 30km, the price will remain unchanged. When the distance is over 30km, from the 31st km, the charge will be 9,000 VND/km. For example : if the distance is 32km, the price will be 180,000 + 2 x 9,000 = 198,000! when I book a ways trip, how much is the waiting time ? With two- way trip, the waiting fee will be free for the first 60 minutes. If the waiting time is over 1 hour, the waiting fee is 50,000VND/ hour. Does prices on DiChungTaxi includes tolls ? If you use taxi airport or long distance ride- sharing service, the price is a package price (including tolls, parking except VAT). With long distance private car, the price does not include tolls. If I book a two ways car, can I get a discount? If you use taxi airport or long distance ride- sharing service, the price in website is the package price (including tolls, parking except VAT). With long distance private car, the price does not include tolls. If I book in advance can I get a discount ? In general, if booking in advance, you can get a discount. For example, if you book a taxi airport before 15 days, the price is reduced by 30,000VND. What is the price of the service from Noi Bai airport to the provinces ? - Under 50km, the price will be calculated as: below 30km, the price is around 11,000-11,500 VND / km, from the 31st km is around 8,500 - 9,000 VND / km. How can I pay for the service ? (2) Payment by bank transfer: via ATM or bank. (3) Postpaid bill payment: pay directly to the driver when completingthe trip. How can I receive a bill for trip ? ( 2): Fill the information about the bill in « I want to get a invoice » in Additional option in « Customer information » when booking. The useful information to invoice includes : company name, company address, tax code and address for recieving bill. The bill will send you within 7 working days. How many people is there in a shared-taxi? Is there a luggage limit ? Sharing- car in DichungTaxi can carry up to 3 passengers for 4- seat car and carry up to 5 passengers for 7- seat car. There is the limit on luggage ( 1 suitcase and handbag/ person). With car sharing service, do I have to wait until dichungtaxi finds enough passengers in the car? - With fixed routes (taxi airport or long distance car- sharing), If DichungTaxi can not find enough passengers, the driver still pick you up on time and the price remains unchanged. - With other routes: If Dichung Taxi cannot find enough passengers, you can cancel booking or choose private . If there are no passengers travelling with me how much do I have to pay ? - With fixed routes (taxi airport or long distance car- sharing), the price remains unchanged even there are no passengers travelling with you. How much the insurance covers customer ? According to transportation regulations, the providers have to buy third party civil liability insurance, the maximum 100 million/ person/ time. If I book but there is no pick-up car, do I receive compensation ? What is discount code ? - Discount code is one of DichungTaxi’s promotion program for regular customers or customers who have an account in promotion program. - With each promotion program, you will receive a discount code from DichungTaxi. You can use this code in the option « I have discount code » in step 3 « Customer information » to save your money. How can can I have a discount code from Dichungtaxi ? You can have a discount code from DichungTaxi bay many ways : Some blog posts at Deals, register to recieve email or follow our Fanpage. If my flight is delayed, what should I do? + Content: Car reservation code, changed information. Was is the difference between two ways trip and round trip ? Two- way trip means travelling and returning in the same car (receive a discount because of taking advantage of empty seats in taxi, except for some route that have fix price like taxi airport). Round trip means travelling and returning in different cars..